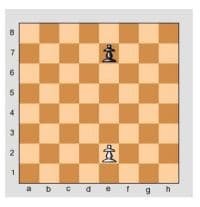 Practice how pawns move with 3 easy games. You can practice the games below at home with your dad or mum, or you can just answer the questions. Remember: White play going up (from rank 1 to 8), Black going down (from rank 8 to 1). If you don’t remember what the ranks are, check the chessboard notation basics. All the games below are Capture The Flag games. Imagine there is a flag at the end of the board, that your army has to capture. 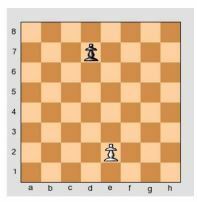 by reaching a position in which it’s your opponent’s turn but he/she has no possible moves. All the following games are played according to these rules. 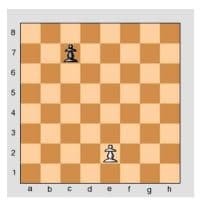 Game n.1: which one would you choose to be (White or Black) in order to win in the following game? If you are not sure, play it with your mum or dad! Game n.2: which one would you choose to win in the following puzzle: White or Black? Game n.3: which one would you choose to win in the following puzzle: White or Black?